WATKINS GLEN, N.Y. (AP) AJ Allmendinger isn’t exactly sure how it happened. More than a month later he’s still beating himself up over it, though. That critical mistake happened in late June at Sonoma, one of two road courses NASCAR’s Cup series competes on every year, and it hurt. Allmendinger, one of the top road racers in NASCAR, led qualifying after the first round and ended up fifth behind Kyle Larson, then won the first stage of the race. The missed shift came about a third of the way through the 110-lap event and blew the engine on Allmendinger’s No. 47 JTG Daugherty Racing Chevy, ending his day. 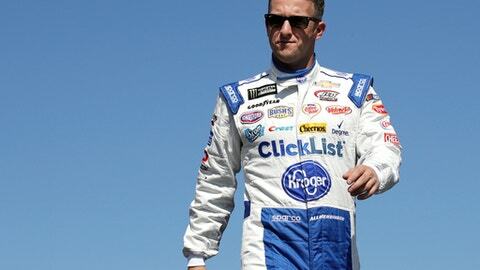 Allmendinger has a chance to atone for that mistake Sunday at The Glen. He’s high on the list of favorites because of his prowess on the twisting tracks, honed during his days in open-wheel competition. The one and only win of his Cup career came four years ago at Watkins Glen in his 213th start in the series when he held off Marcos Ambrose in a fender-bending duel at the end . Allmendinger beat the best in Ambrose, who was dominant in NASCAR’s top two series at The Glen, and that victory made JTG Daugherty Racing eligible for the postseason. ”I’ve come here and put a lot of pressure on myself,” Allmendinger said. ”We all know what the ultimate goal is when we show up here. I think over the past couple of years it’s gotten a little more difficult. Only five races remain in the Cup regular season, and this year the playoffs will include the road course at Charlotte. Allmendinger, Aric Almirola, Kyle Larson, and Brad Keselowski are entered in Saturday’s Zippo 200 in the Xfinity Series. All are securely in the top 16 in points, the cutoff for the postseason, but none has won a Cup race this year, so some extra seat time on the 2.45-mile, high-speed layout can’t hurt. With sunshine in the forecast for Sunday’s race, the turnout is expected to match the most recent years, which means a crowd in excess of 90,000.